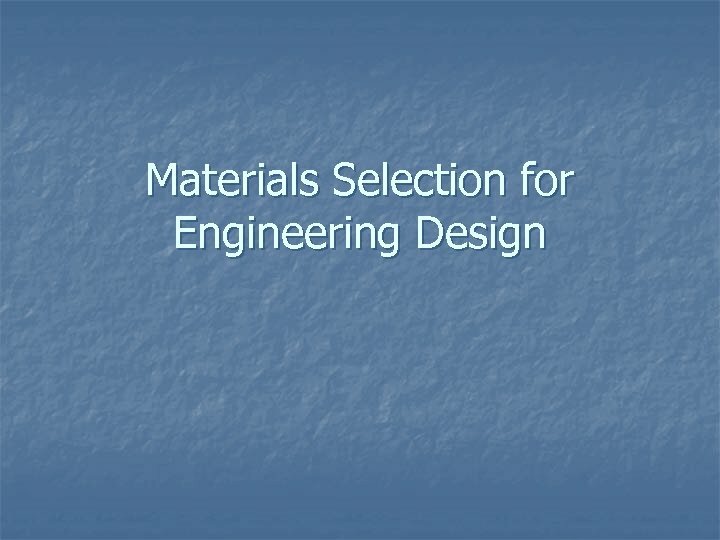 Materials Selection n The designer of any product, other than software must get involved with material selection. Only occasionally will the exact grade of material be specified by the customer. 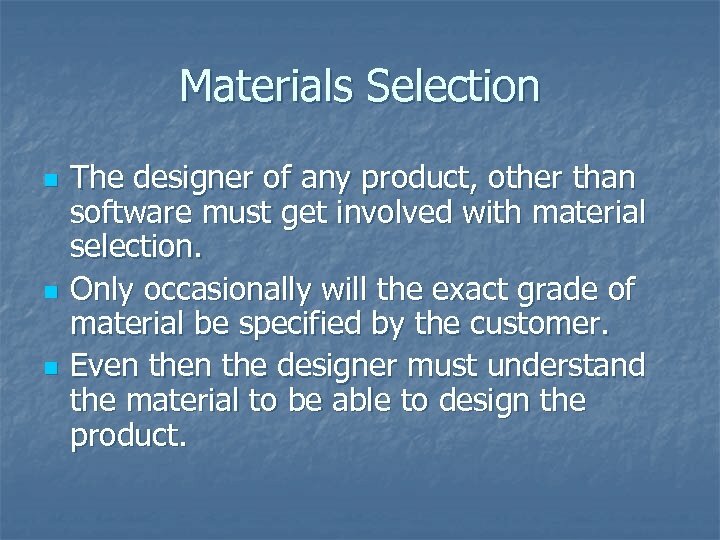 Even the designer must understand the material to be able to design the product. 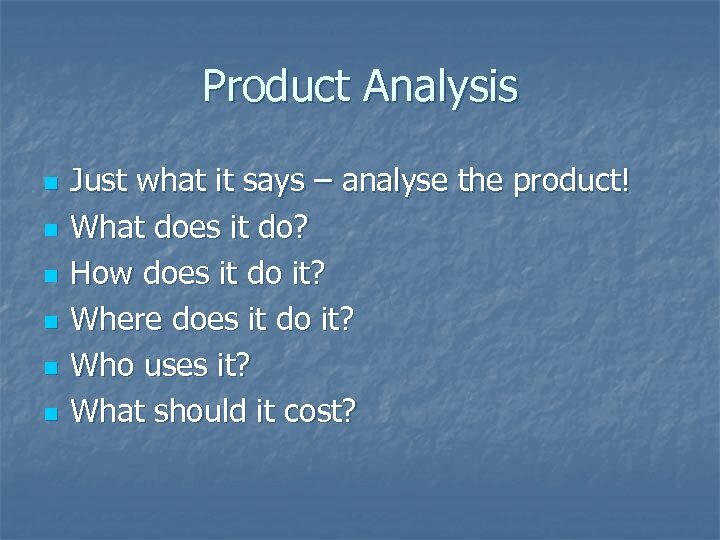 Product Analysis n n n Just what it says – analyse the product! What does it do? How does it do it? Where does it do it? Who uses it? What should it cost? 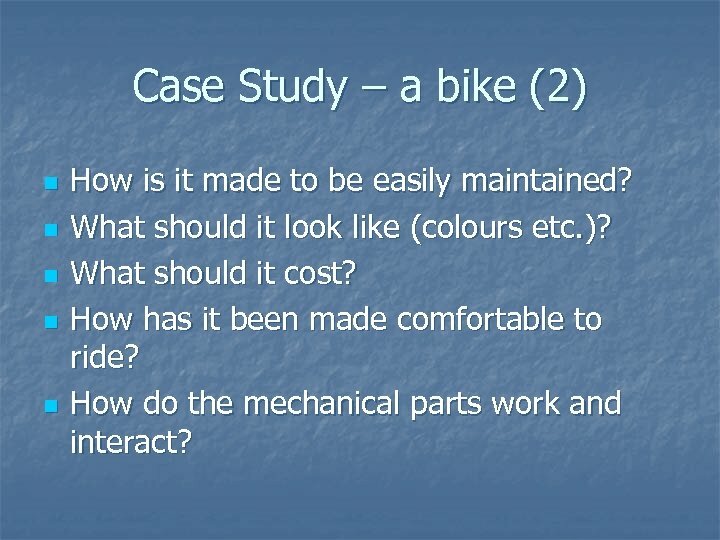 Case Study – a bike (2) n n n How is it made to be easily maintained? What should it look like (colours etc. )? What should it cost? How has it been made comfortable to ride? How do the mechanical parts work and interact? 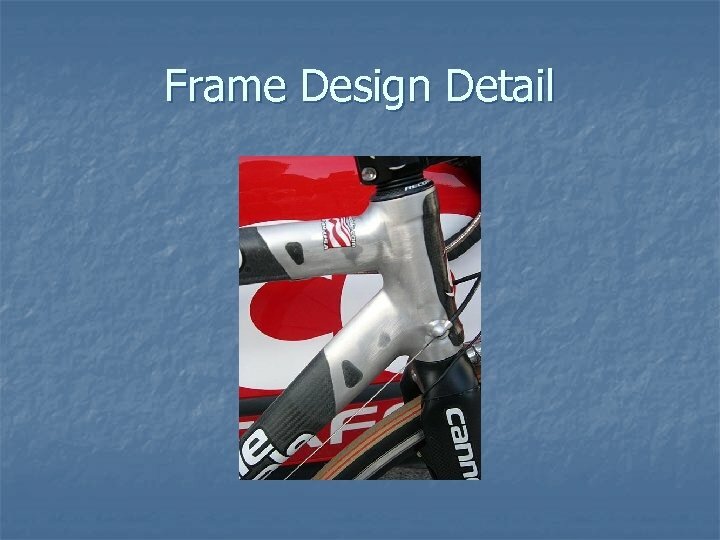 Component or system? n 1 st problem is……. 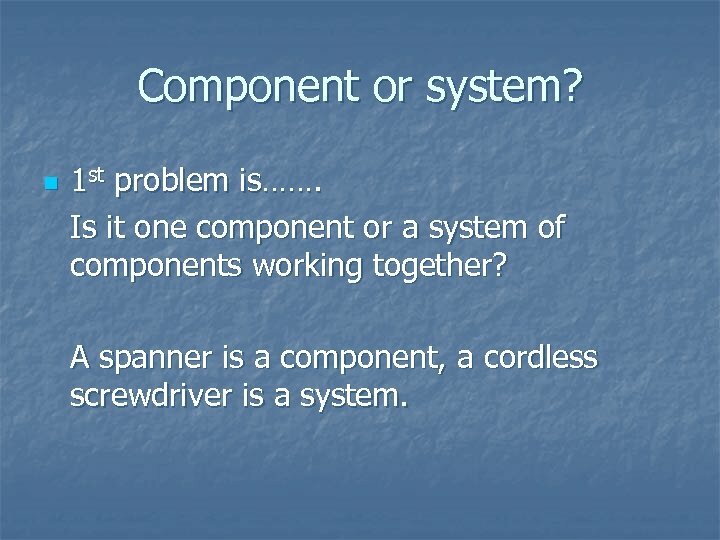 Is it one component or a system of components working together? 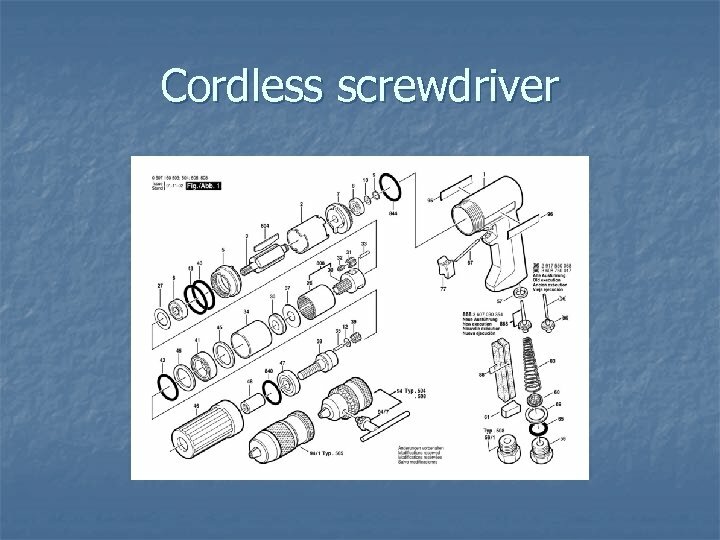 A spanner is a component, a cordless screwdriver is a system. 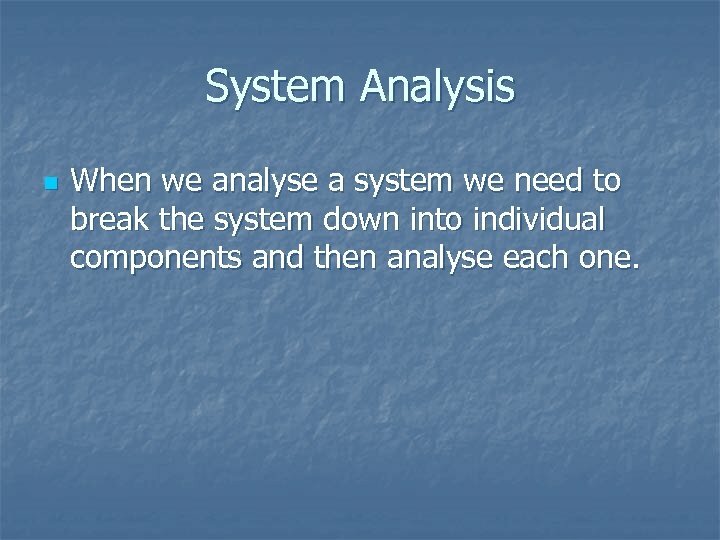 System Analysis n When we analyse a system we need to break the system down into individual components and then analyse each one. 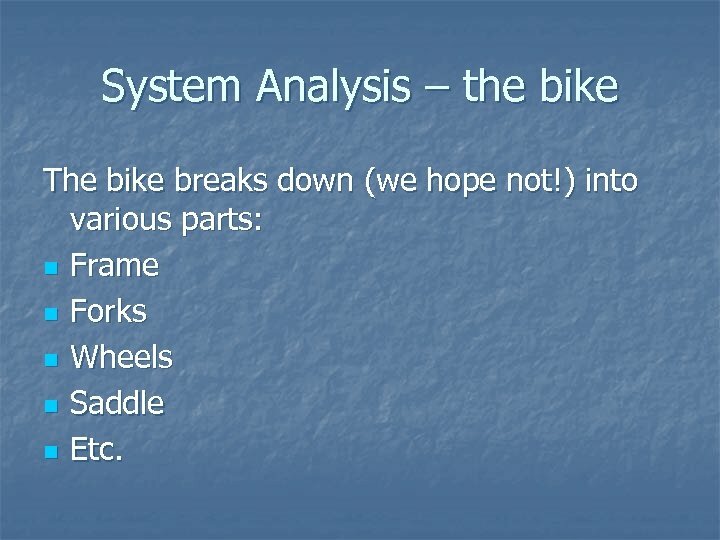 System Analysis – the bike The bike breaks down (we hope not!) 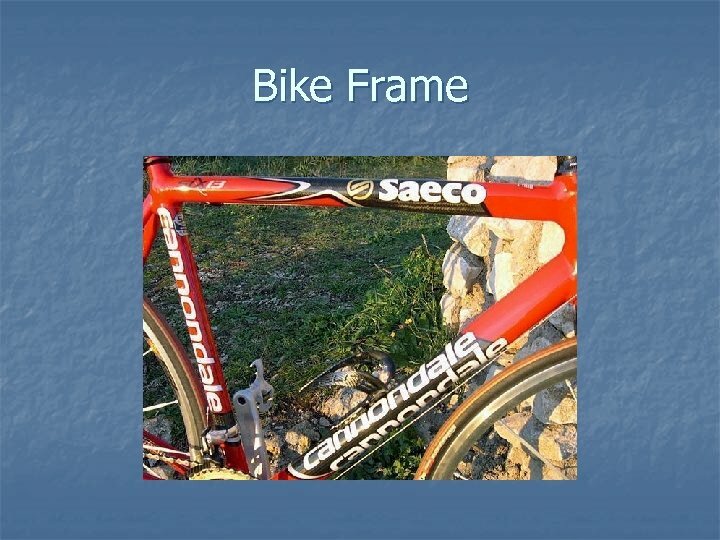 into various parts: n Frame n Forks n Wheels n Saddle n Etc. 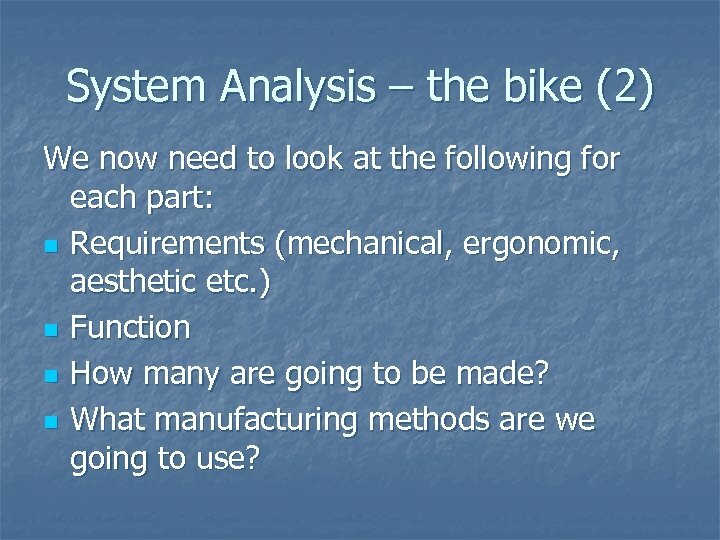 System Analysis – the bike (2) We now need to look at the following for each part: n Requirements (mechanical, ergonomic, aesthetic etc. ) 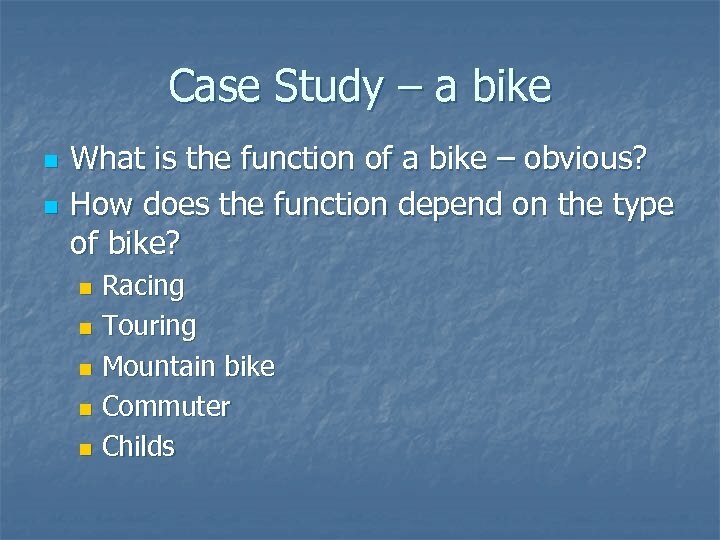 n Function n How many are going to be made? 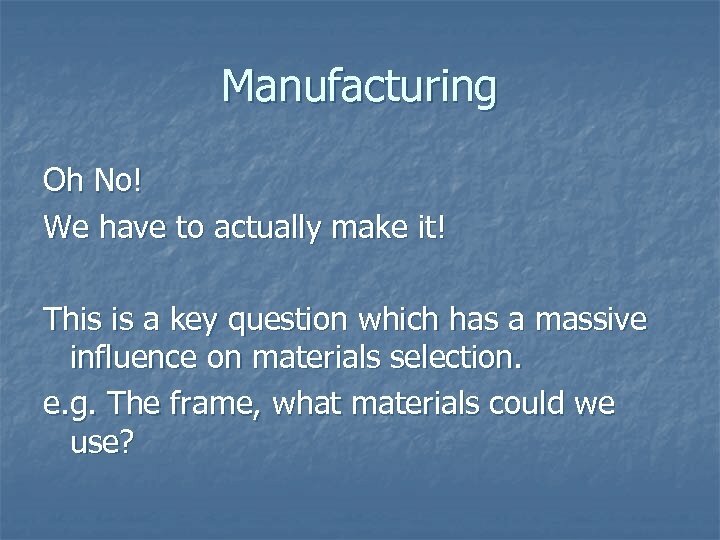 n What manufacturing methods are we going to use? Manufacturing Oh No! We have to actually make it! 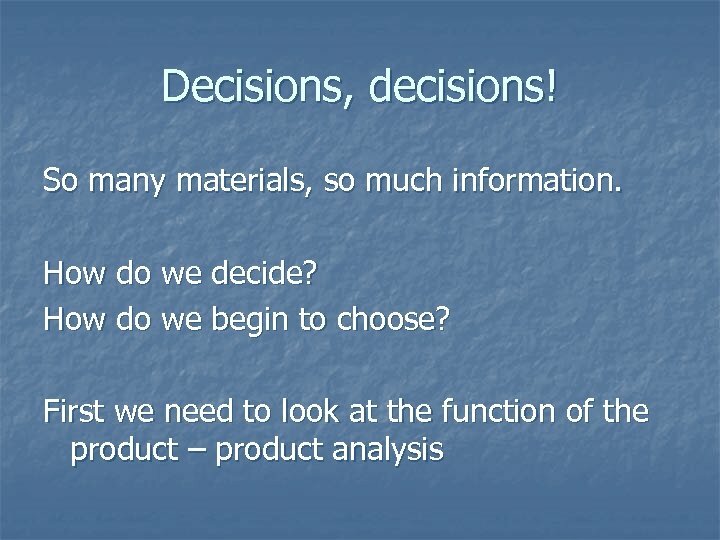 This is a key question which has a massive influence on materials selection. 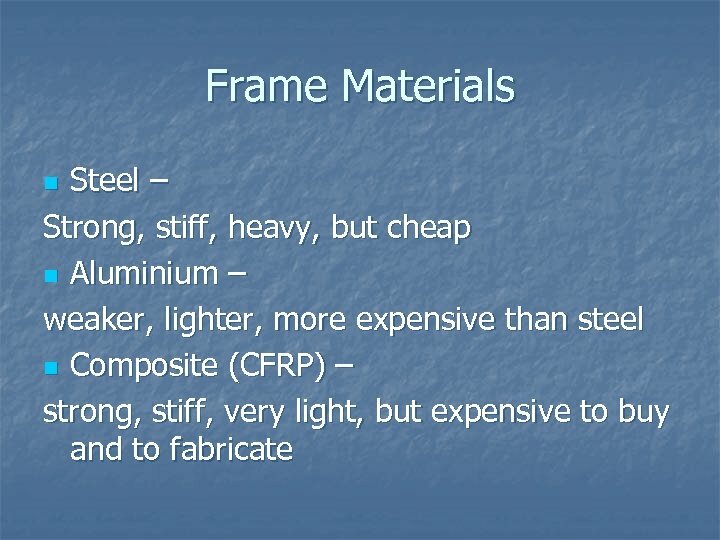 e. g. The frame, what materials could we use? 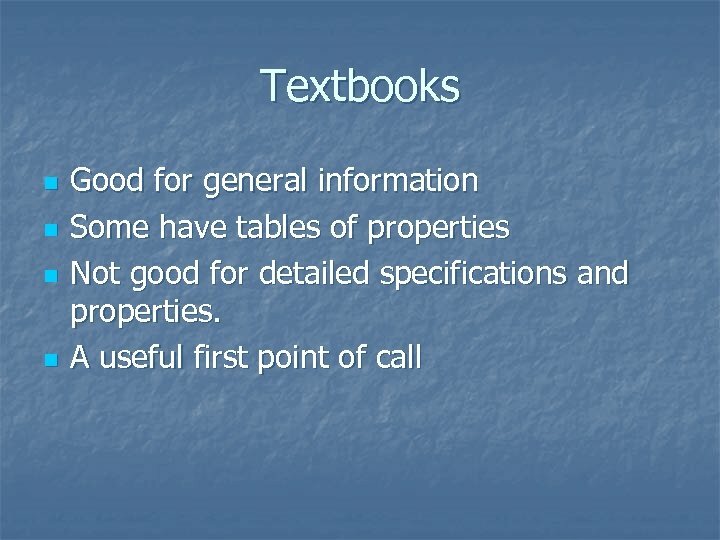 What Properties? 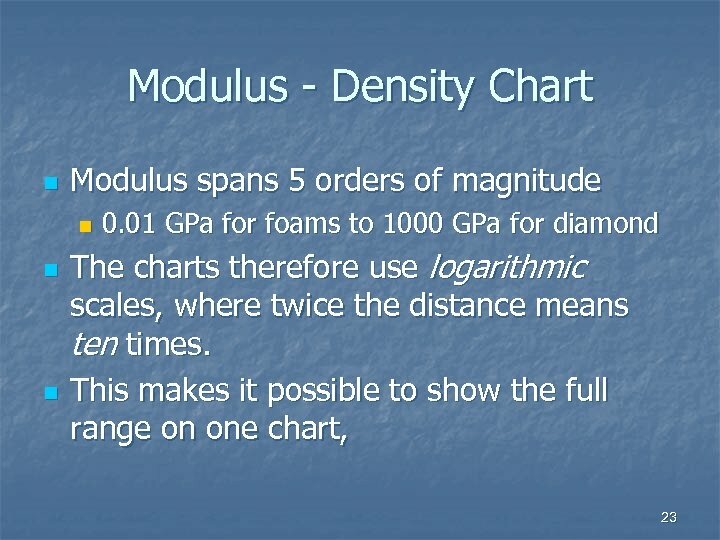 n n n Mechanical – Strength, modulus etc. Physical – Density, melting point. Electrical – Conductivity, resistivity. 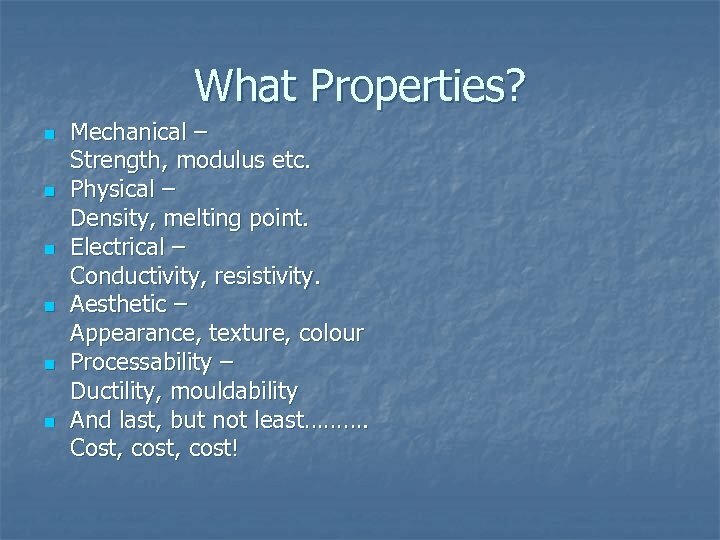 Aesthetic – Appearance, texture, colour Processability – Ductility, mouldability And last, but not least………. Cost, cost! 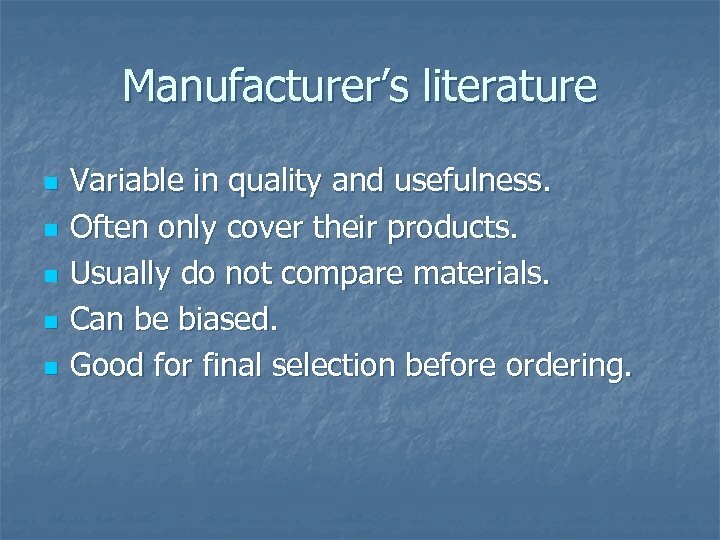 Manufacturer’s literature n n n Variable in quality and usefulness. 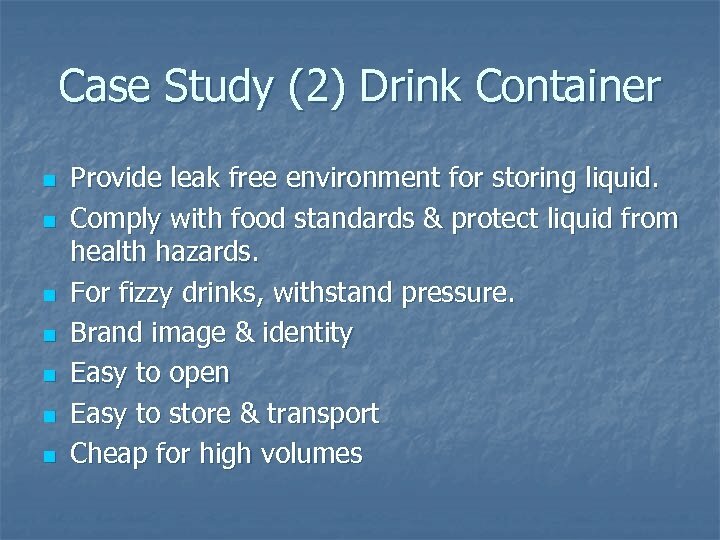 Often only cover their products. 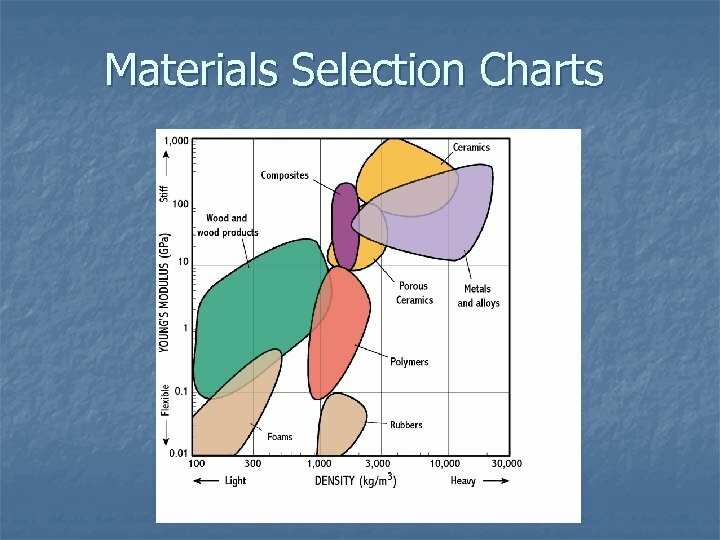 Usually do not compare materials. Can be biased. Good for final selection before ordering. 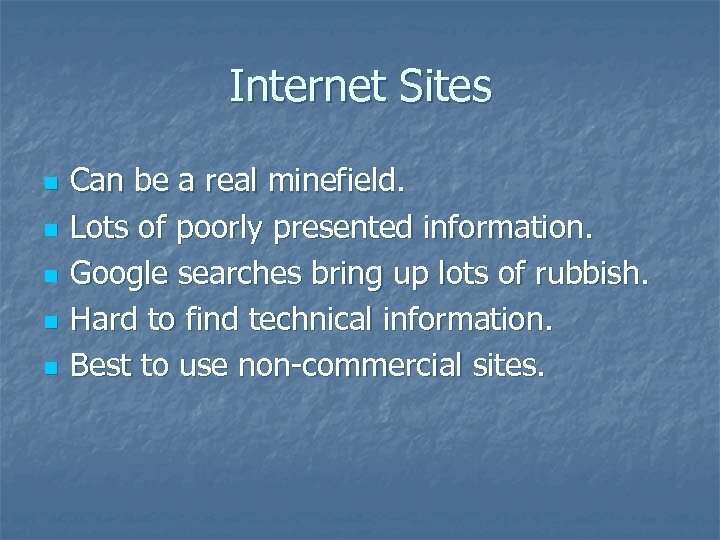 Internet Sites n n n Can be a real minefield. Lots of poorly presented information. Google searches bring up lots of rubbish. 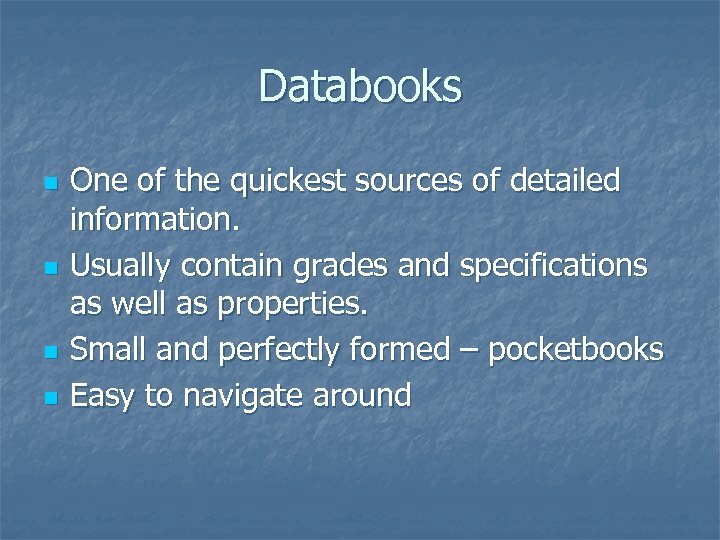 Hard to find technical information. 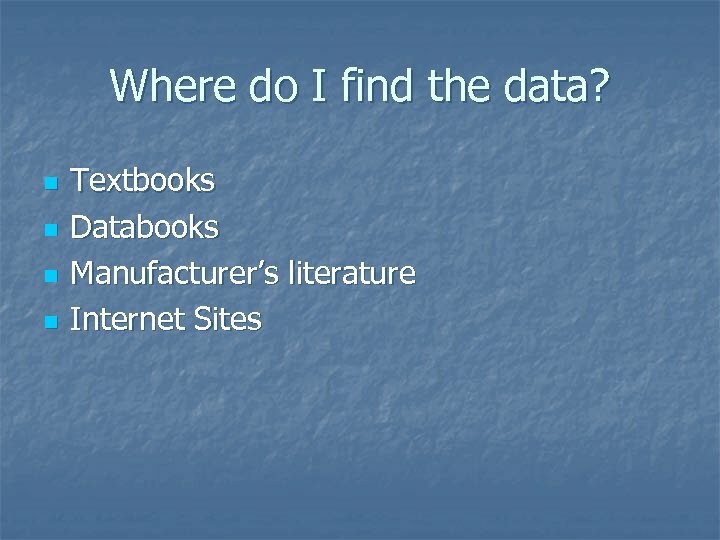 Best to use non-commercial sites. 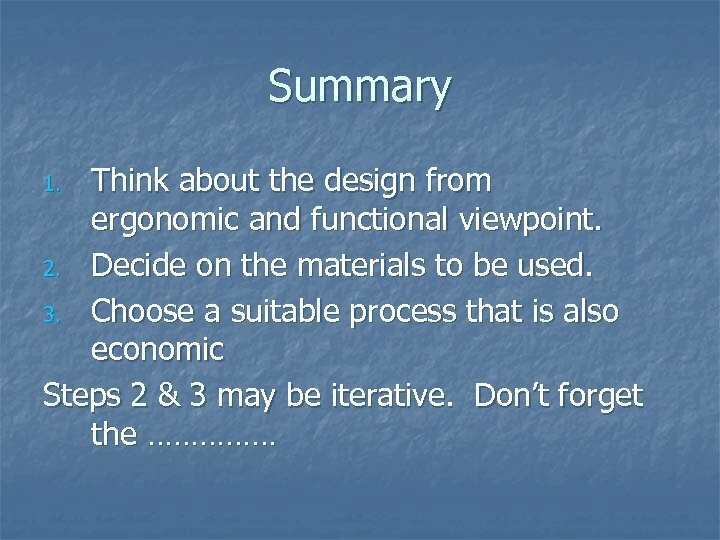 Summary Think about the design from ergonomic and functional viewpoint. 2. 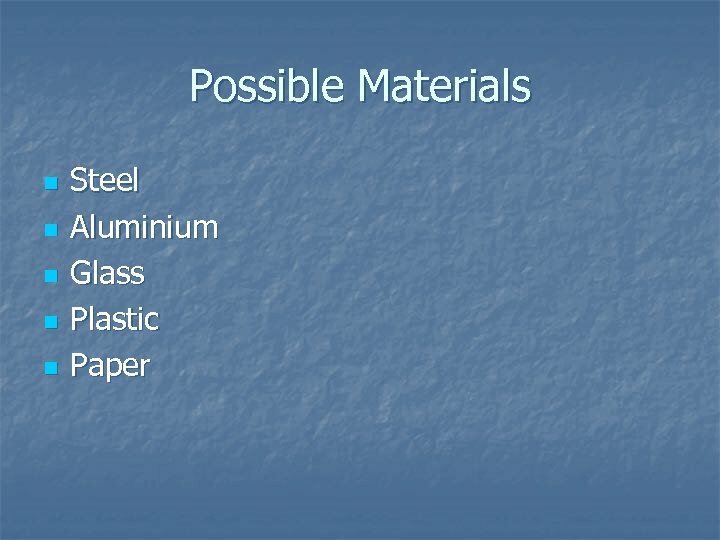 Decide on the materials to be used. 3. Choose a suitable process that is also economic Steps 2 & 3 may be iterative. Don’t forget the …………… 1. 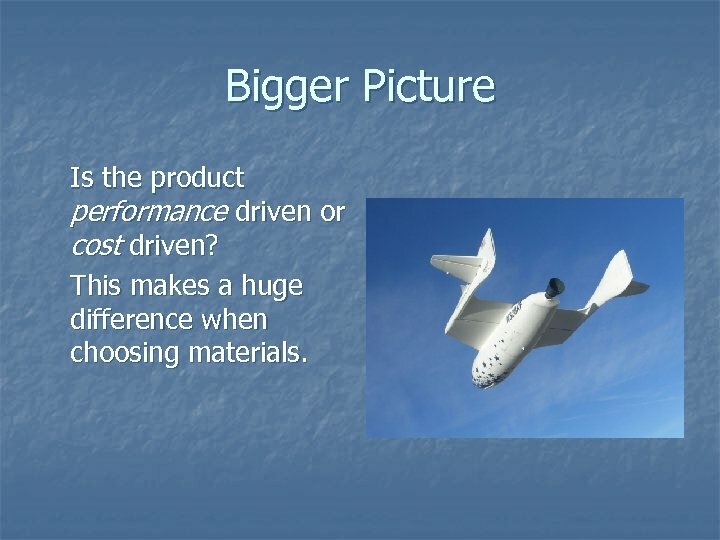 Bigger Picture Is the product performance driven or cost driven? 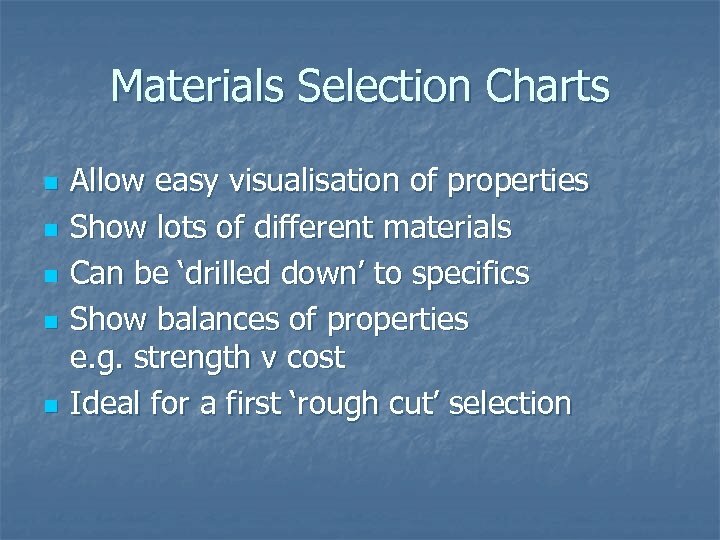 This makes a huge difference when choosing materials. 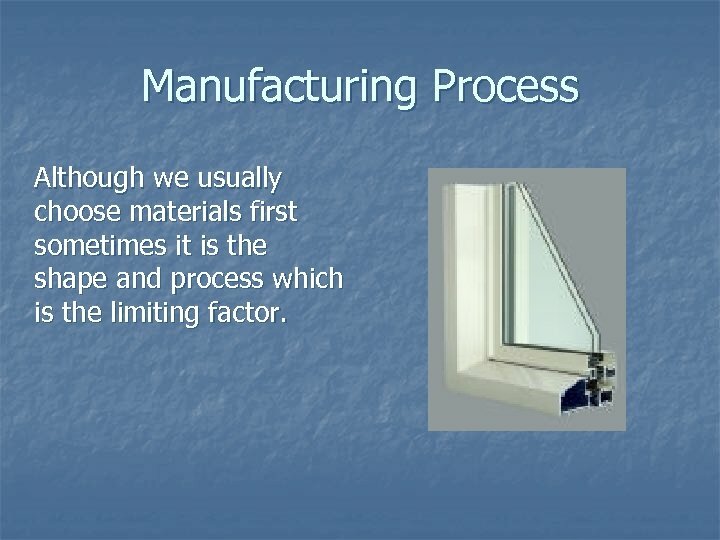 Manufacturing Process Although we usually choose materials first sometimes it is the shape and process which is the limiting factor. 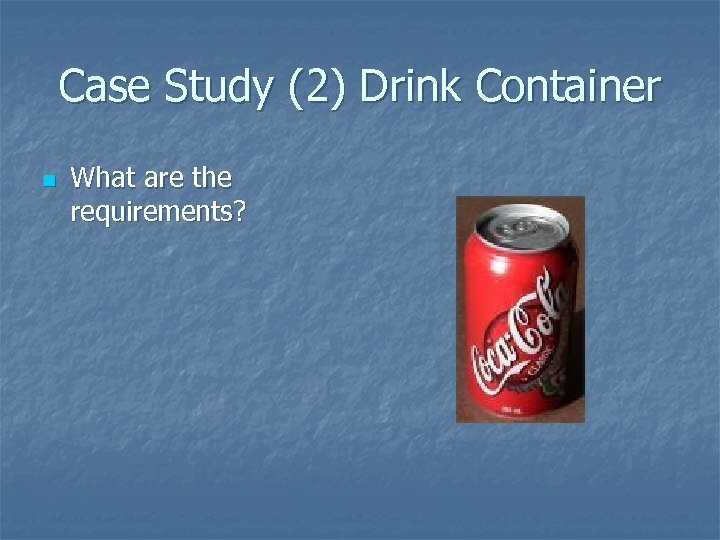 Case Study (2) Drink Container n What are the requirements?